Prisms can be used for long-range measurement with high accuracy of ±(2 + 2ppm x D)mm. Measure distances up to 4,000m with a single AP prism for the SET630R3. Each model is equipped with Sokkia’s absolute encoders, which employ the RAB (RAndom Bi-directional) code technology first developed for the Digital Level SDL30. The absolute encoder uses advanced digital signal processing to offer high reliability and stability. 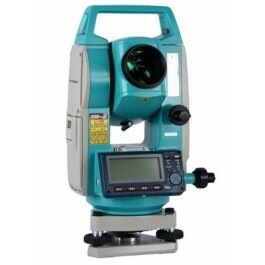 Measurement can be started as soon as the total station’s power is turned on. A small-diameter visible laser ensures extremely accurate measure- ments of the points you wish to survey, and a red visible laser beam can be used to confirm measurement points without looking into the telescope. The laser conforms to IEC Class 2, so that anyone can use it safely without special supervision. Series30R Reflectorless Total Stations provide both high precision and speed, thanks to a measurement accuracy of ±(3 + 2ppm x D)mm and 1.3-second continuous measurement (fine measurement mode). In addition, all models have a range of over 100m (320 ft.). * Each model features Sokkia’s renowned optics, in which the central portion of the objective lens acts as the light emitter and the lens periphery is the receiver. Combined with the small-diameter measuring beam, this optical system gives you various advantages: accuracy even when the measured object is at an angle, accuracy with fine linear objects, and reliable measurements over fences and between trees. Maximum measuring range A: Average conditions: slight haze, visibility about 20 km (12 miles), sunny periods, weak scintillation.